Miss Helen, the original biscuit maker, died three years ago, but the biscuits go on, plain buttermilk or topped with shredded Cheddar cheese. Bakers sell about 800 on an average morning, and up to 1,500 to the summer Saturday tourists. 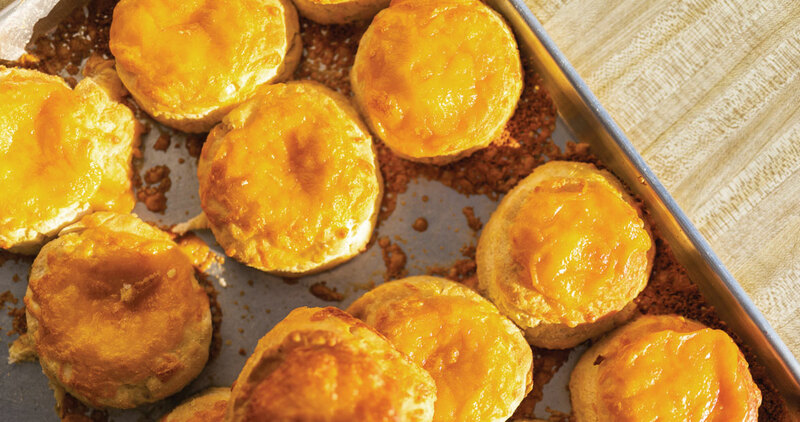 The eastern part of the state is known for cheese biscuits for reasons lost to history. Abrams restaurants claim to be the “home of the original cheese biscuit” and place a large hunk of hoop cheese (milder than Cheddar) inside each biscuit while it’s still hot, which is the typical approach. Mom’s Grill in Washington, located inside a convenience store, uses sharp Cheddar. In Boone, Everybody’s Loaded Biscuits food truck offers coastal transplants a taste of home, stuffed with local Ashe County cheese.